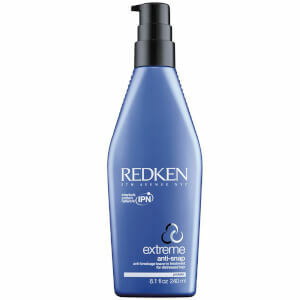 Repair and strengthen your dry, damaged hair with Redken Extreme Rescue Force. It’s an intense, silky rich fortifying treatment for your distressed hair. The condition of your hair will be beautifully enhanced with increased manageability and extra shine thanks to Redken Extreme Resuce Force. After shampooing apply to towel-dried hair. Leave on for 5 minutes (for deeper conditioning leave on for as long as desired).